Manitoba Pageant: Bottles! Bottles! Any Old Bottles? Bottles! Bottles! Any Old Bottles? Stanley S. Silver of Winnipeg is a bottle man; more precisely, he and his wife are bottle people. They collect old bottles. 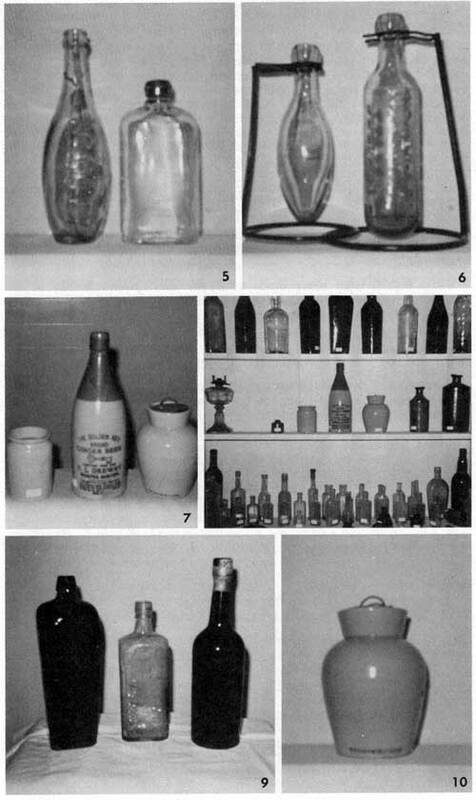 In the course of following this interesting hobby, they have gathered approximately 300 bottles from many different sites in Manitoba, and in the process have learned a great deal about the history of the province, particularly those segments which have to do with transportation and settlement. 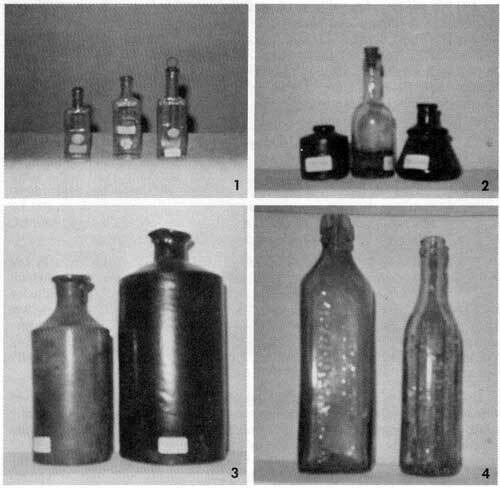 Many of their bottles were found at construction sites on the original main line of the Canadian Pacific Railway; some were discovered at Point Douglas, and others were unearthed at the refuse pits of pioneer settlements, abandoned farm homes, and other places where old buildings have been torn down and the land left vacant. At some sites the bottles may be covered by a foot or more of earth or debris, and to determine their exact location a homemade prod is care-fully pressed into the ground, a fork or spade being used to unearth them. What sort of bottles are found? Whiskey, wine, beer, patent medicine, snuff, pill, oil - "in fact the whole gamut of the bottle industry from 1864 to 1917," reports Mr. Silver. A few interesting finds are as follows: Gooderham & Worts Distillery 1881; McDonagh & Shea Brewery 1881; Weyman's Snuff 1881; Gordon Mitchell Druggist, Winnipeg 1905; The Famous DDT 1868; Arnold's Ink 1881; C. W. Cole 3 in 1 Oil 1881; Burdock Blood Bitters 1900; and HHH Medicine, Dr. Kilmer's Root Liver Kidney and Bladder Cure, Dr. S. N. Thomas's Electric Oil, Newbro's Herpicide Kills The Dandruff Germ - for each of which no date has yet been fixed. Many bottles of various shapes, sizes and colors might be classified generally as commercial containers. They are usually quite plain, not unlike contemporary bottles used for the same purposes, and some have the name of the product and the firm etched or embossed on their faces. Cosmetic bottles and jars, some of them strikingly unusual in color or design, evidently served a dual purpose - as containers for balms, lotions, or compounds, and as decorative pieces for milady's dressing table. A fascinating byproduct of this hobby is the interest it stimulates in the bottle industry itself, in glassware generally, and in the changes which took place in the manufacturing process. In the 1700s the bottle industry in England and Ireland was a large one, and the manufacturers prided themselves on their "clear flint glass." But in spite of their boast, it was not entirely translucent, and 150 years later they were still producing "clear flint" glass and bottles which, by modern standards, are partially opaque. Bottle stoppers of cork or glass which were inserted into the neck of the bottle, and glass marbles which were clamped in place by a spring clasp were of early 19th century vintage. Screw threads and caps were a later development. Stone bottles for ink and glue came into general use in the late 19th century, and many "senior citizens" will remember the "granite" bottles for "stone" ginger-beer - a popular beverage of yesteryear. 1. Perry Davis Vegetable Painkiller (1881), C.P.R., Dagero, Whiteshell. 2. (l) Pottery inkwell (1880-90), Old Norquay (Cypress River, north of Swan Lake); (c) bottle found with liquor still in it, Milford; (r) mucilage bottle (1880), Milford. 3. Pint and quart ink bottles (1900), Denby, England, Point Douglas. 4. (l) William Hay & Fairman Company, Glasgow, (1881), C.P.R., Dagero, Whiteshell; (r) E. L. Drewry (1902) Point Douglas. 5. (l) Stanley soda water (circa 1900), Point Douglas; (r) special whiskey flask, threads blown manually, Mile 29, Ingolf, Ontario. 6. Soda type bottles, (l) (1881), Mile 29, Ingolf, Ontario (r) (1880-90), Nelsonville. 7. (l) Crockery jam jar (circa 1900), Point Douglas; (c) E. L. Drewry crockery ginger-beer, Point Douglas, (r) snuff jar (1881), Point Douglas. 8. Part of Mr. and Mrs. Silver's collection. All bottles on lower shelf are from Milford. 9. (l) Gin case whiskey bottle (1881), Mile 29, In-golf, Ontario; (c) Gordon's Dry Gin (1900), Point Douglas; (r) Gooderham and Worts whiskey, C.P.R., Dagero, Whiteshell. 10. Weyman's Snuff (Copenhagen), (1881), Mile 29, Ingolf, Ontario. Green and red bottles were being made in England as early as 1754, and fifty years later "purple-blue tinted" bottles and glassware were popular. When it became known throughout the country that this color was a favorite of George IV, the name "Royal Blue" was fixed to it - a name which has been carried forward to this day by the garment trade, by the College of Heralds in fixing the color for armorial bearings, shields, and crests, and by the Royal Navy in its official specifications for blue in the flags of the Commonwealth. In England the experimentation in the introduction of color into the bottles and glassware spanned 150 years, and it was not until the 1850s that the industry was able to offer a variety of colors which bore such trade names as: alabaster, turquoise, amber, canary, topaz, chrysoprase [chrysoberyl - yellow or pale green], cranberry, light and dark ruby, and black-brown. The glassmakers in England were innovators, but they followed, nonetheless, the lead of the great glassmakers on the continent of Europe and were influenced particularly by the fine work of the Bohemian craftsmen. Glass bottles were being made in Upper and Lower Canada in the 1850s, and many of these must have been brought to Red River and to various trading posts by both the North West Company and the Hudson's Bay Company. Bottles, glassware, crockery and dinnerware were also shipped to York Factory and distributed throughout the west and the northwest. So the field of search is a wide one. A segment of the social history of the people who dwelt on the sites may be reconstructed in part from the bottles and other articles such as files, spoons, forks, dishes, pots and pans which Mr. and Mrs. Silver have found in their patient searching. Moreover, some fifty horseshoes, removed from the sites of railway construction camps, are lingering evidence of the contribution made by dobbin to the westward thrust of the Iron Monster. So, while searching for bottles, other artifacts are found and other lines of enquiry and research emerge - all of which makes the hobby a most interesting and rewarding one.